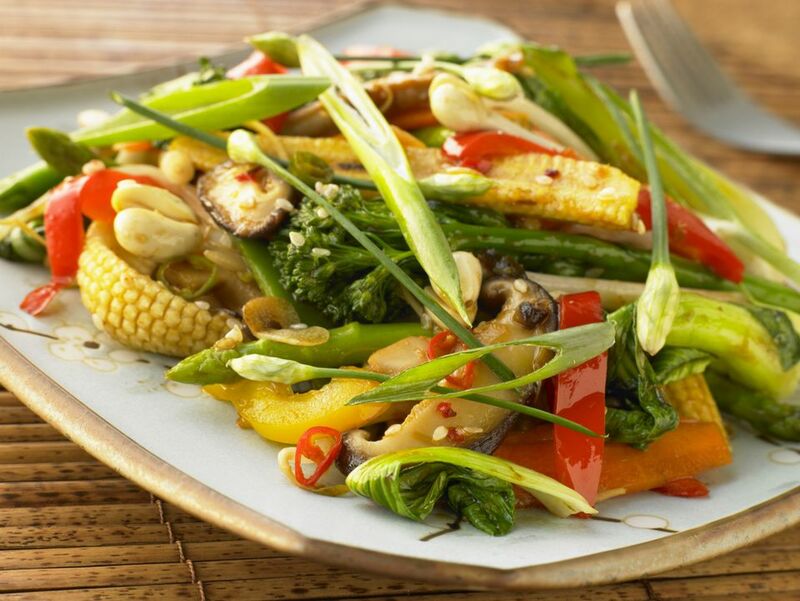 This Thai-inspired veggie stir-fry is super easy to make, and quick too! Once you have the vegetables chopped, you're nearly done, as the cooking is lightening-quick. The homemade stir-fry sauce is equally simple to make just stir the ingredients together in a cup, and you're ready to go. As a bonus, this vegetable stir-fry can be made with nearly any assortment of vegetables, or just one vegetable (such as broccoli), if that's all you have in your refrigerator (or are in the mood for). To make this stir-fry into a complete meal, add 1/2 cup cashews, tofu, or cooked shrimp during the last minute of cooking time. Place all stir-fry sauce ingredients (oyster sauce, soy sauce, fish sauce, brown sugar, garlic, and cayenne pepper) together in a cup and stir well—This may seem like a lot of garlic, but you'll need every clove to create this rich-tasting sauce—Set aside. Place oil in a wok or large frying pan over medium-high heat. If using high heat, be sure to have all your ingredients ready and close at hand, as this dish fries up fast! Add the onion plus 2 tablespoons of the broth and stir-fry 1 to 2 minutes until the onion has softened. (Using a little broth instead of adding more oil keeps fat/calories lower). If your wok is dry, add a little more broth plus the firmest vegetables (this would include carrots, mushrooms except for button or brown mushrooms, green beans, eggplant, asparagus, etc.). Stir-fry 2 minutes, or until these vegetables have softened (eggplant should turn translucent). Add 1 to 2 tablespoons broth whenever wok becomes dry. Add the rest of the vegetables, plus the sauce. Stir-fry until the vegetables are bright green, but still crisp (1 to 2 minutes). Remove wok from heat and do a taste-test. If your stir-fry needs more salt, add a little more fish sauce. If it tastes too salty, add a squeeze of lemon juice. If too sour, add a little more sugar. Add more cayenne pepper if you prefer it spicier. Serve with plenty of steamed rice. This is also excellent with a little chili sauce (for those who like it spicy), such as authentic Nam Prik Pao Chili Sauce.